The former General Secretary of the STUC Bill Speirs has died, aged 57. Tributes are being paid to the former General Secretary of the Scottish Trade Union Congress (STUC) Bill Speirs who has died, aged 57. His predecessor Campbell Christie described him as an 'outstanding personality of the trade union movement'. Bill Speirs was a socialist and a trade unionist who was among the most talented of his generation. He shunned a parliamentary career as he rose among the ranks of the STUC. Campbell Christie, the STUC General Secretary from 1986-98, said: "I worked with him or 20 odd years, he was one of the outstanding personalities of the trade union movement during that whole period." His politics were that of the pragmatic left. He was suspicious of markets, was pro-home rule and was aggressively internationalist, being a leading advocate for Palestine and against apartheid South Africa. Jim Devine MP, Labour member for Livingston, said: "I went to see him and there were messages from the South African government, there were messages from Palestine, messages from various other individuals from right throughout the world and I can think of very few if any other politician or trade unionist who would have that sort of support from right throughout the world." When Thatcherism was at its height, Mr Speirs' reputation blossomed as an articulate and strategically sharp operator in defence of workers. He was on the vanguard of anti-Conservative agitation against the Poll Tax and was a keen architect of the cross-party Scotland United campaign. As a former Labour Party chairman he was a committed member, but was never narrow or sectarian. At the STUC his eight years as General Secretary from 1998 kept the unions at the centre of the political, cultural and civic debates of the time. 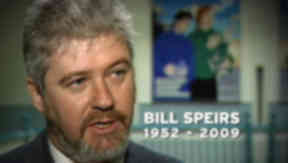 Former First Minister Jack McConnell said: "One of the remarkable things about Bill Speirs was that everybody will have disagreed with him at some point. He had opinions on everything and was never afraid to confront the vested interests, he was never afraid to speak his mind, but also he was always winning to make new friends and to build alliances to make things happen." When he retired from the STUC three years ago, he had a long battle against illness. It pained family and friends who witnesses the slow and inevitable decline. Those who knew him will remember a giant of his generation, who had a natural gift for politics and all its many machinations. They will remember most of all that he fought on behalf of people and causes that he loved. Scottish Labour leader Iain Gray also paid tribute. He said: "Bill Speirs was one of the finest servants and leaders the Scottish Labour and Trade Union movement has ever had. Every one of us in the Scottish Parliament owes him a debt of gratitude for his tireless work in the campaign for home rule.